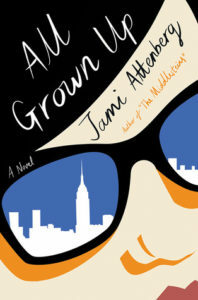 Jami Attenberg’s latest novel, All Grown Up is about Andrea Bern, a woman in her early 40s who is childless and single. She had planned to be an artist, and still paints occasionally, but gave up in her 20s and now works in advertising and lives in Brooklyn. Andrea is definitely messy – self-absorbed and immature, yet also funny and self-deprecating. She asserts that she wants neither a husband nor children, yet also laments her single status and complains about being lonely. She is close with her mother and brother, but when her brother and his wife have a daughter with severe health issues, she is incapable of providing any of them them the support they need to help live with their daughter’s round-the-clock needs. I enjoyed the structure of the book – the chapters jumped around chronologically, with each chapter named for a woman who had some impact on Andrea’s life. Events that were explored in detail in one chapter were mentioned in passing on others, which I liked once I got used to it. I like Attenberg’s writing, which, like in The Middlesteins, is wry and observant. But in the end, All Grown Up, left me cold. Andrea routinely sabotaged herself and her relationships, and she was so rarely empathetic or supportive that I just didn’t like her much. She could be generous, but only with money, rarely with her feelings. All Grown Up was moderately entertaining while I read it, but I have not thought about it once in the week since I finished it. Just not much there. Fat is a hot topic right now. I just came from a reading by Lionel Shriver from her new novel, Big Brother, about a woman with an obese brother. And coincidentally, this morning I finished Jami Attenberg’s The Middlesteins, which is about the toll that a woman’s obesity has on her extended family. Richard and Edie Middlestein are late middle-aged Jews living outside Chicago. They have two kids, Benny and Robin, and two grandchildren, Josh and Emily, who are about to become b’nai mitzvah. Their marriage is crumbling, in part because Edie is topping 300 pounds and her health is rapidly deteriorating, and in part because there is no love left between them. Edie is domineering, critical, and stubborn, while Richard is defeatist and distant. When Richard leaves Edie, the Middlestein family goes into crisis mode: their children blame Richard and leap to their mother’s defense, while Benny’s wife Rachelle, a controlling, perfectionist stay-at-home mom, tries to save her mother-in-law through exercise while barely containing her fury at Richard. The characters are one-note. Other than Richard, we don’t really learn much about each person other than a few traits – Rachelle is obsessed with being thin and is generally annoyed. Robin is depressed and alcoholic and afraid of being in love. Edie likes to eat and is angry at her husband. But what more do we know about them? The Middlesteins is a like a snapshot in time without much follow-up other than some random fast-forwards sprinkled throughout the end (which I did appreciate). This is a book about obesity and Edie’s insatiable need for food. But what propels it? Why is she so driven to eat? What caused the void that she is trying to fill? Other than her parents dying when she was still pretty young, there isn’t much explanation for her eating other than that she likes the way the junk food tastes. I was put off by the depiction of Jewish women in this novel. There is not a likeable one in the bunch. They are shrill and bitchy and not particularly nice to those around them, especially men. What was Attenberg’s point in writing The Middlesteins? There’s some good stuff in here about the American dream – Richard founded a pharmacy in the Chicago suburbs that catered to conservative Jews in his small synagogue, and it built up into a small chain of stores before it was overtaken by the big box conglomerates that basically put him out of business. There is also some good stuff about finding love past middle age, coming out of an unhappy marriage. But otherwise this book left me pretty empty. I only finished it this morning, and I feel like I already can’t remember that much about it. I listened to The Middlesteins on audio. It is narrated by Molly Ringwald (of Samantha Baker and When It Happens To You fame). I love Molly Ringwald – don’t get me wrong – but her flat, almost angry tone of voice didn’t make The Middlesteins any more compelling. In fact, her narration may have been one of the reasons I didn’t love the book. Her voice is harsh – remember her in The Breakfast Club? – and that suffused the book. There is one chapter that stands out, though – it is called “Seating Chart” – and it is told in the first person plural by four couples who are the Middlestein’s closest friends. They are sitting at Edie and Richard’s grandchildren’s b’nai mitzvah, talking about the Middlesteins and their shared history. Molly Ringwald nailed that chapter – with her Midwestern affect with the Jewish twang, I felt like I had met these couples many times. So, this wasn’t my favorite. Have you read it?